People who know Romney say that in private he’s actually quite funny, and—contrary to his reputation—he does, at times, pull off a good joke or two. But in public he faces the challenge that every American politician does: to make us believe he’s a regular guy. Since few politicians actually are regular guys, this does indeed take work, and one of the primary vehicles for accomplishing it is humor. Humor works best when it’s spontaneous or, at least, gives the impression of spontaneity. Unfortunately for Romney, it’s when he veers into this terrain that his best intentions often go off the rails. Given the relentless media scrutiny nowadays, including viral videos of politicians’ every misstep, it would be a brave soul who would dare to be spontaneous. But politicians need to seem to be, and modern presidents have all been coached to tell self-deprecating stories, supposedly demonstrating that they don’t think they’re better than us. Some, like Kennedy, were gifted at it from the start. Others definitely weren’t, but they doggedly did their best, although Jimmy Carter’s gag writer compared his job to being Franklin Delano Roosevelt’s tap dance instructor. The only president who absolutely refused to tell jokes at his own expense was Richard Nixon. The most accomplished humorist in the White House, however, was Ronald Reagan, “our acting President” as Gore Vidal liked to call him. Reagan’s genial self-confidence was so secure that his self-deprecation could hit the target head-on and still not leave a bruise. “I have left orders,” he said cheerfully, “to be awakened at any time in case of national emergency—even if I’m in a Cabinet meeting.” Reagan knew that we knew he wasn’t paying attention, but when he acknowledged it as frankly as that, it ran right off his back. One of Reagan’s gags even helped to win an election. Running for a second term, Reagan got lost and confused during his first debate with Walter Mondale, which was briefly seen as a serious warning sign about his candidacy. But at the second debate he was well prepared. Hank Trewhitt of the Baltimore Sun said, “You already are the oldest president in history, and some of your staff say you were tired after your most recent encounter with Mr. Mondale. I recall that President Kennedy had to go for days on end with very little sleep during the Cuba missile crisis. Is there any doubt in your mind that you would be able to function in such circumstances?” Reagan answered, “Not at all, Mr. Trewhitt, and I want you to know that also I will not make age an issue in this campaign. I am not going to exploit for political purposes my opponent’s youth and inexperience.” Trewhitt could only reply admiringly, “Mr. President, I’d like to head for the fence and try to catch that one before it goes over.” The gag did nothing to address the issue, but it brilliantly ignored it. 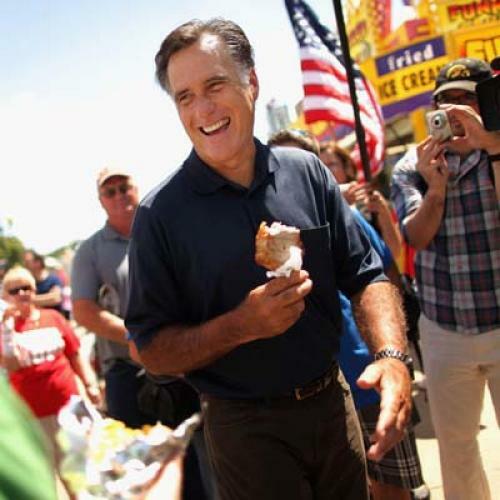 Romney, by contrast, is an ungifted actor, which is why he especially needs to stay away from trying to be spontaneous. Last June, there was a most peculiar incident at Mary Ann’s Diner in Derry, New Hampshire, when he was posing for a group photo with several waitresses. Suddenly, and inexplicably, he gave a startled yelp and jumped forward. It turned out he was pretending that one of the waitresses had pinched his rear end, which came across as just plain weird. His prepared gags, on the other hand, are better, but they often strike the wrong tone too. He caught a lot of flak, for instance, for telling a group of unemployed people in Florida, “I’m also unemployed.” The people in the room with Romney laughed heartily, but upon repeated exposure the joke was read by many as amazingly clueless and insensible. To be sure, a humor deficit like Romney’s isn’t necessarily a fatal flaw, because someone who is too funny can also come off as insufficiently serious. The Arizona congressman Morris Udall liked to tell a story about a response he got at a barbershop in Maine: He looked in at the door and, meaning to introduce himself, said “Mo Udall, running for president.” “Yeah,” the barber said, “we were laughing about it this morning.” Udall eventually titled his autobiography Too Funny to Be President. And strangely enough, one of the best self-deprecating jokes of all time was told by Mitt Romney, during the 2008 campaign: “The other day I said to my wife, ‘When you married me, did you ever, even in your wildest dreams, imagine that one day I’d be meeting with a room full of presidential kingmakers?’ She said, ‘Mitt, you weren’t in my wildest dreams.’” Romney may not have written that one himself, but he told it well enough, and for once he did seem like a regular guy. Leo Damrosch is a Research Professor of Literature at Harvard; his most recent book is Tocqueville’s Discovery of America.